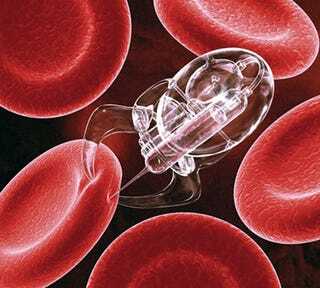 Reader Wendy asks: When will nanobots clean out my arteries? While medical molecular machines are not likely to appear in the clinic soon, there's a decent amount of research going into the development of nanoscale robotics, and not only for therapeutic use. One could easily imagine these widgets appearing in diagnostic assays and nano-scale manufacturing. Before we can hope to command tiny robots to crawl or swim to a damaged or stenotic artery to effect repairs, we first need to build tiny robots capable of crawling or swimming.Luckily, molecules that can crawl already exist in nature. Kinesin, for example, is a protein that crawls along microtubules in our cells - hitch a bit of cellular cargo to it, and it'll go along for the ride. Molecules with "legs" made of DNA can be coaxed into a vaguely similar "walk" on a surface also composed of DNA, while less biological variations could be useful in the computing industry. There are a number of molecular motors that can convert chemical or light energy into motion - getting useful work out of that motion, however, can be tricky. Not all tiny robots are nano, of course. Dartmouth's "inchworm" is relatively huge at over a hundred microns in length, and this six-legged crab-bot is even larger - the chassis is made of polymer with an engine composed of rat heart tissue. When the tissue contracts, it provides power to crawl the 'bot at about 0.002 miles per hour. Not bad for a ride less than a millimeter long. When nature provides a convenient source of motility, like heart tissue or bacterial gliding, harnessing it can be a lot easier than building a molecular machine from scratch. The micromotor below harnesses bacteria to turn its rotors. The bacteria move from the center of A into the channels. When they meet the circle at the end (B, C) , they tend to be going in one direction (D). The rotor (E, F) fits into the circle and is coated with sialic protein which the bacteria stick to and push. It's like the beginning of Conan: The Barbarian, except microscopic, and with better acting. While true nanobots would have to be even smaller than the crab or this rotor, they do show an interest in producing useful locomotion in increasingly smaller packages. Besides, to produce a useful bot may require a collection of various nanoscale parts that assembled together produce a larger-than-nanoscale 'bot. If you can't crawl, you're going to have to swim. Again, nature is ahead of us with the flagellum - basically, a propeller for microbes. The adaptability and motility of these bacteria are a few of the reasons why researchers are using them as inspiration for their own devices and working to modify them to deliver drugs to cancer cells, and perhaps heart disease follow. If it's not bacterial in origin, don't be surprised if the world's first medical nanobot is sperm-propelled. Building nanoscale machines from scratch that can swim is harder than it sounds (and it ought to sound pretty hard). For one thing, our physical intuition about swimming breaks down at the nanoscale. If you were to shrink, Fantastic Voyage-style and find yourself swimming in water, you'd think the water had turned into a highly viscous liquid like molasses. This has to do with the dynamics of fluids at different length scales, as E.M. Purcell discussed in his Life at Low Reynold's Number talk. Simply shrinking a design that swims well at the macroscale is no guarantee that it'll zoom along at the micro- or nanoscale. Once you have a nanoswimmer or nanocrawler (or have appropriated one from nature), you're going to have to figure out how to guide it towards your target and either release its payload or do whatever repairs need to be done. As far as heart disease is concerned, it's going to be a race between the nanobots and extensive genetic tinkering to prevent the problem in the first place.